As I previously mentioned in this post, I had been researching small crossbody and saddle bags for about three months now. I don't ever buy a bag on impulse, at least not anymore. I mull things over before making my decision. I usually try to see the bag in person so I can touch the leather, inspect the hardware, take note of its functionality, and try it on. This may sound like Type A to the extreme, but when it comes to dropping some cash on a bag, I'm anything but lazy. It's also a fun process! The thrill of the hunt can be even more exciting than the actual purchase. Unfortunately, I didn't see this bag in person. I tried all of the higher end department stores like Nordstrom, Bloomingdales, and Neiman Marcus but none at the South Coast Plaza location had this bag in stock so I gave it a whirl online during Shopbop's sale. $100 dollars off the retail price? Sold! Although it's small, it's quite roomy! It has two compartements where you can store the essentials. It's not large enough for a regular wallet, but other than that, all of my other must-haves fit nicely. These include cell phone, cards, keys, some lip products, and a small pill case. It has a pocket in the back for easy access to a phone. The strap is adjustable, so it really will suit any height! A big plus for a petite girl like myself! You can adjust to wear it crossbody or as a shoulder bag. It is THE perfect shade of blush (thistle is the name of the color). Not too pink, not too white. It almost has a slight lavender tone, which is beautiful! I can't get over the color, almost like ballerina slippers. It makes for a feminine appeal to an otherwise androgynous bag. The leather is very smooth and supple. Loeffler Randall isn't as common as other brands, which I actually prefer. I most likely will not see it on others in and around my area. Saddle bags are trending, but I have yet to see this particular bag on anyone. The leather is so soft, that I fear of wear and tear. I'm using a protectant to ensure that doesn't happen, or at least not quickly. The snap closure of the bag is a bit cumbersome. You really have to press down on the hardware to get it to lock in place. Opening it is easy though, and it's not a hassle to get in and out of like my Chanel bag. 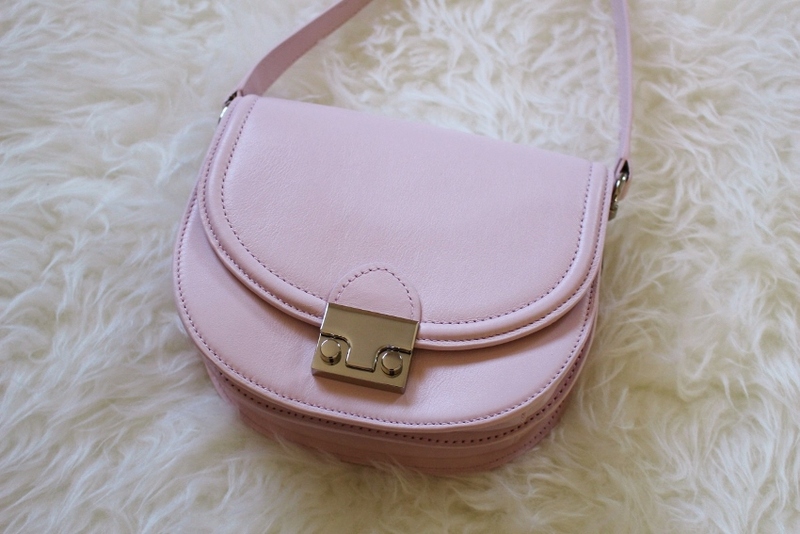 Overall, I am in love with this beauty and am even planning on another Loeffler purchase in the future. I think this brand has me hooked! If you have any specific questions that I didn't cover, feel free to leave me a comment below! Thank you for reading! Does it hold the structure of the original bag? Like my Tory Burch bag was holding up fine for a few months but now it's weakening! Oh gosh I hate that! Well I've only had it for a couple weeks so that remains to be seen! I hope so, I'll keep you posted! 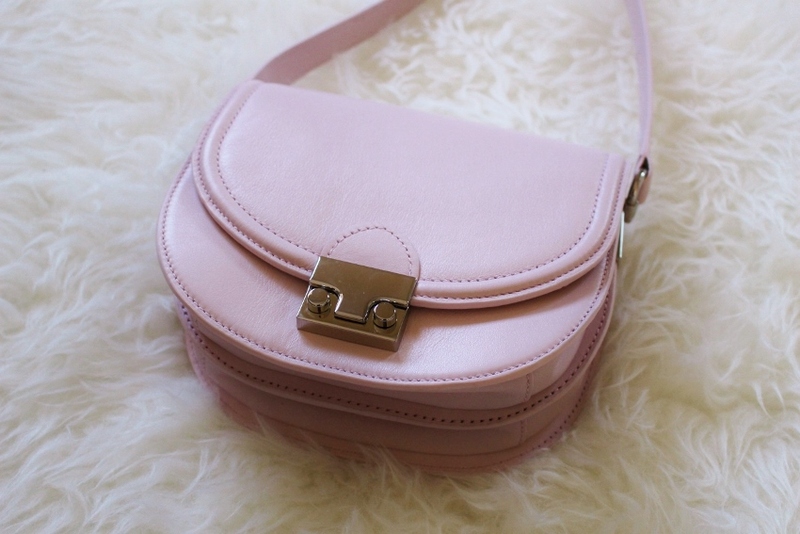 Love your bag - such a pretty colour and amazing that you got it on sale! I'm not really familiar with bags from this brand, but the pushlock reminds me of the one on my pashli. Great pick! such a good buy, that bag is so cute. If I didn't have my chloe I would totally go for that one, I kinda still want one anyway. Perfect color too. I absolutely love that shade of pink! You're right - it really is perfect! Very cute bag and I'm so glad you were able to get it on sale and that it worked out for you!! Also, regarding your comment on my blog, it was fun to hear that you've also come full circle on nail colors! I really did enjoy experimenting with a big variety for awhile but now I'm just kind of over it and want to stick to classics. It's also just easier to not worry about whether my nail polish will clash with my outfit! Ha! Who knows, in two years I might go back to crazy colors but for now, this is where I am! It's just easier to consolidate my beauty drawers! But who knows, you're probably right and we'll go back to other colors at some point I'm sure! Beautiful bag, I'm so in love with the color!